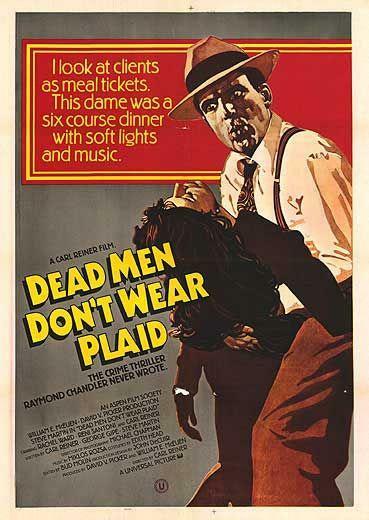 Dead Men Don’t Wear Plaid. Universal Pictures 1982. This film’s use of archive footage within the narrative reminds me of What’s Up, Tiger Lilly?, but when I try to draw a tighter comparison, they aren’t really all that alike. The Woody Allen film takes a few foreign films and uses the audio to dub a new story onto it. I can’t quite tell if this is new material supported by old films or new material stringing old film clips together, but there’s much more new content on the screen than in “Tiger Lilly”. I get the idea it has more in common with Forrest Gump than the other. I’m sure there’s a better example of new material interacting with old material to tell a new story, but I can’t bring it to mind. Otherwise, this looks like a standard noir detective spoof rested on Steve Martin’s capable back. It’s hard to say much past that, since everything I can find about it focuses on the classic clips. Private detective Rigby Reardon is approached by Juliet Forrest, who believes her father, the scientist and cheesemaker, wasn’t killed by an accident, but murdered. Reardon takes the case, following clues about “Friends of Carlotta” leading him to many different people he can only stand at arm’s length from and talk to as if they’re even farther away. And as he follows the trail, he finds himself seeing Juliet less as a client and meal ticket, and more as a woman he’s getting too close to, with breasts that frequently need adjustment. As I was writing the above paragraph, I remembered one of the best examples of this technique: the Star Trek DS9 episode “Trials and Tribble-ations”, which puts characters inside the events of the Original Series episode “The Trouble With Tribbles”. That did it more smoothly than this movie, but they had the advantage of a cohesive source story, higher-quality source video, digital effects, and almost 15 years of refined techniques. The choice (in this case necessity) of shooting the entire thing like the old-fashioned films it’s referencing also reminds me slightly of Young Frankenstein. The use of the vintage film clips in this movie is largely the point of it. Pretty much every time Reardon interacts with someone from the silver screen, it’s in a sequence that stops the story for some jokes. His partnership with Philip Marlowe is probably the most plot-relevant example, and it’s still mostly for jokes. They made such a big deal about getting close to Walter Neff, a name I recognized from Double Indemnity, that I was expecting him to play a bigger role than two short scenes mostly focusing on Reardon in drag. He doesn’t even say his name in his clips, and the character’s role is so removed from the source film, that I wonder why they kept the name. There’s not much else to talk about the film besides the central gimmick. It’s otherwise a fairly unremarkable noir pastiche. As usual, even though I’m well aware the plot is an excuse for the jokes, I get annoyed when the plot gets set aside for over ten minutes to do a bunch of interviews with blondes who might potentially do some spying, only to find out that none of them will be suitable and the whole thing was a wild goose chase. Watch this movie: for some fun with hopefully familiar faces from the past. Don’t watch this movie: if you like a whodunnit thriller with a resolution that makes sense.